Read the interview with Austrian artist Ulla Rauter, whose solo show was presented at viennacontemporary by gallery MAM Mario Mauroner Contemporary Art in the framework of ZONE1. Ulla Rauter studied transmedial art at the University of Applied Arts in Vienna. She works as a media artist and musician at the junction between sound and visual art. Her work includes performance,sound sculptures, musical performances and self-built instruments. In 2008 she received a prize from the Ö1 Talent Scholarship, in 2009 she was awarded a scholarship from the Federal Ministry for Science, Research and Economy and in 2011 the Start-Scholarship from the Ministry for Arts and Culture. In 2014 she was an artist in residence at the Nordic Artists’ Center Dale in Norway and in 2015 she received a studio scholarship in Rome from the Arts and Culture Division of the Federal Chancellery in Austria. 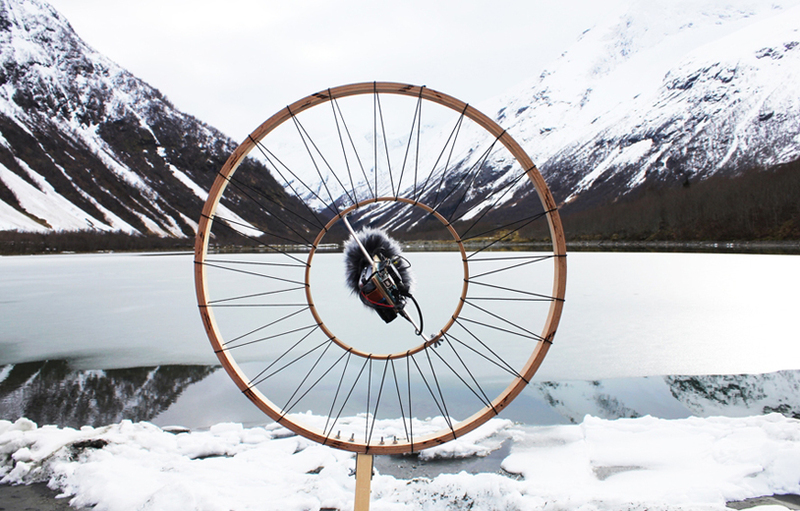 Kristina Kulakova: Where does your fascination with the sound come from? Ella Rauter: Since I was a kid I had a strong connection to music. I played piano for many years and it was planned that I would go to conservatorium, but for me it was a bit too narrow and I wanted to experiment. At the time I was also interested in visual art and graphic design and I went to the school for graphic design, where we had the free class, which combined painting, composition and etc. There I realized that graphic design for me was too narrow as well. Soon after that I heard about this media class at the University of Applied Arts, where one can work in any media experiment. I saw some works and it was very interesting, because it was nothing I knew before. It was not the technology, which was fascinating for me in this class but that people did so many different things. During the studies I began to work on the interface and on the connection between visual and sound art. I in my practice it often happens that one work comes out of another. For example when I worked at facade scans I used light to produce sound and at some moment I thought it would be nice to have some instrument that produces certain specific light and makes the sound, so I built this instrument. Or while doing experiments with computer software, I use a visual programming language in which I write special patches for my works, and then I combine it with sensors. 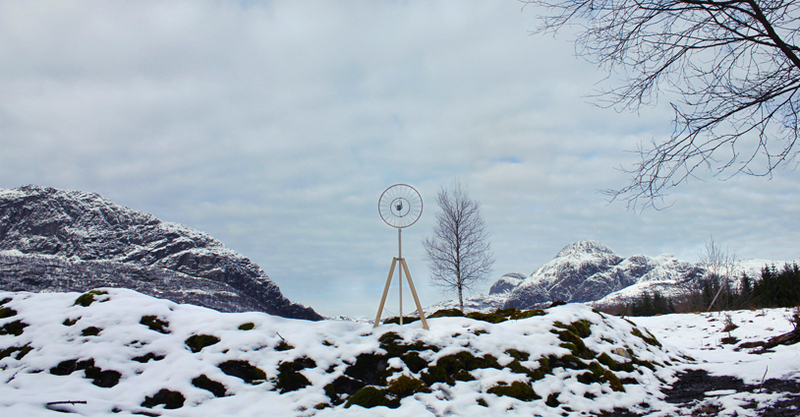 When I had the residency in Norway I decided to work on silence. Since I was a student I wanted to build a silence detector. So I built one. The silence detector TACET, points to moments of silence, to the acoustic pauses in the ambient noise. The letters of the installation only light up once it is quiet, indicating the absence of sound. Any noise at the level of the detection threshold makes the lights disappear again. When I got the residency in Norway I went on with this topic. I built the silence collectors, and later on a silent flute. Silence collectors are stand-alone recording devices, able to collect silent recordings autonomously. The recorder gets an infrared signal and starts recording only when the actual sound level comes below a certain value. As soon as loud noises are interrupting the silence, the record will pause the recording. The collected recordings represent moments of relative silence, which draw attention to the lowest-level acoustic events and the differences in the noise floor according to the characteristics of the place where it’s been recorded. I think every sound artist is fascinated by silence, because it’s the opposite of sound and since John Cage used it it’s very important also for classical composition, the silent brakes are very crucial, because they make the structure. One work I really admire is the speaking piano of Peter Ablinger. What is important for you when you look at the artwork from other artists? I like good ideas. It might be a very simple work but with a good idea. Sometimes, during the process someone can say: oh, that artist uses the same idea for his or her work as you do, for example uses buildings to produce the sound. But in the end the works turn out completely different because everyone has their own way of doing things. What was on display at viennacontemporary? I showed the Voice Shapes — 3d objects of spoken words, then there will be installation ‘the magnetic needles’, which I showed in Moscow previously. I also did the façade scan of the Marx Halle and it has been screened in the booth. The idea behind it is that the façades can turn into a kind of filmic experience for the passer-by. Façade-scan translates these visual elements into auditive signals. The surface of the city gets “scanned“ by a sine-generating sound tool. Using the photographs of façades as musical scores, every part of the exterior architecture generates a particular sound and the façade’s elements become tones, intervals and rhythm. The vertical line defines the pitch; the horizontal movement along the rows of houses corresponds to the timeline of the soundtrack. In that way, each building produces its own specific sound-experience and it’s sonic identity. Is it important for you to know the collector, who is buying the work? It is an interesting question. I once took part in the young artists auction and it is sort of anonymous: the artists are not there during the sale. After the auction you get a letter, which says: ‘you work has been sold for that price’ but not to whom. And that was a very strange feeling for me. I didn’t like it so much. On one hand, it was exciting to think that somebody has got my work now, but I would rather have a personal connection to the buyer, when I am part of the dialog and can explain my works. The voice shapes for example are like portraits of the voice. So sometimes I record the voice of the person, who buys it afterwards. Where would you take a friend, who is interested in sound art in Vienna? I think one should go to off-spaces like möe or celeste. They have many sound performances. Nowadays there are a lot of sound exhibitions in Vienna. When we started to run our festival „sound manifestos“ 5 years ago there were not so much shows like that, but it has changed since then. Sound art has made really big step forward. There are museums giving huge spaces to sound artists, it wasn’t like this before. Another interesting place is at Museumsquartier is TONSPUR. There are regularly new sound installations. What is for you the sound of Vienna? The sound of the Bim (historic Viennese trams). I live close to the depot and they always ring the bells in the evening when they arrive back. Do you have a favorite silent place? I once was in the university of music, where they have a sound absorbing room, where it’s nearly zero sound, but you can not stay too long in this room, because you loose orientation. It is not normal for a person. My favorite silent place is (being) under water! 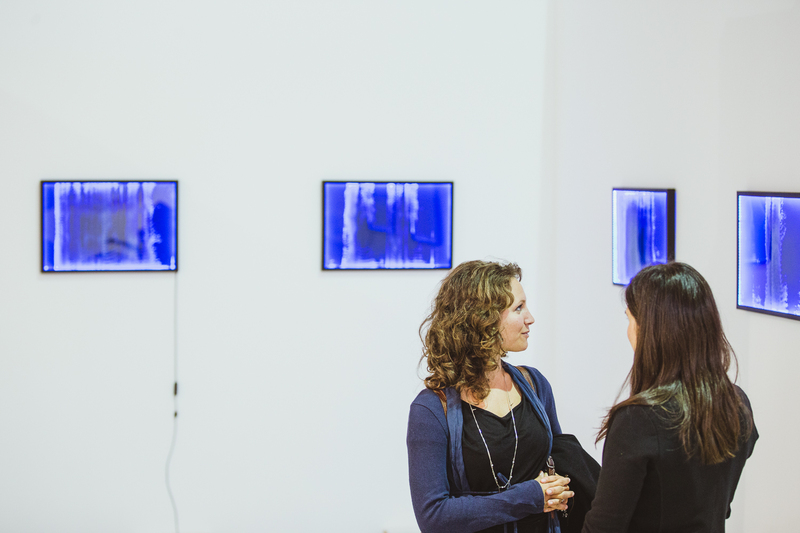 Tags: art, Art Fair, artist interview, celeste, contemporary art, interview, möe, MuseumsQuartier, Peter Ablinger, silence detector, sound art, sound art in vienna, sound installation, sound manifestos, the sound of Vienna, Ulla Rauter, viennacontemporary, viennacontemporary 2015, Voice Shapes. Bookmark the permalink.